- Someone else is coaching them to do it a different way. Keeping my eye on this list helps me to frame the lessons better and approach any hesitation I sense in the sessions. The best lessons in the world are useless unless the student's hurdles to application are identified and discussed. Part three of the Preparation IQ Series will examine our upcoming Oklahoma FFA Stand and Deliver speech training conferences. 3-hours, 50-150 high school FFA members, purpose is to train them on how to write, research, practice, deliver and answer questions for competitive FFA speech contests. - This is our 11th year to run these conferences, so we have the basic content, flow and techniques well developed. We start by reviewing the detailed notes we have gathered over the past few years. However, we sharpen the material every year by adding in new lessons we've developed, including new activities and providing updated resources. - An important preparation technique for this type of skill-development conference is providing and clearly explaining resources and exercises the students can use and do when they get back home. - There are 12 separate areas of speaking tips covered at Stand and Deliver, but in only three hours. Each section needs to be examined, but they are not all equally important. This means we have to prioritize and spend less time on the lower items. - This is a "dry information" heavy program. Therefore, we must include a good amount of humor, interaction, small moments of fun, etc. The 7-Minute Rule must also be followed. 7-Minute Rule - Have the audience change the way they input information every seven minutes or so. Options: listen to speaker, watch a video, listen to other people speak, write notes, talk to partner, do an activity, reflective thinking, listen to music, group discussion, etc. Part two in our Presentation IQ Series focuses on a banquet speech I delivered tonight. 30 adults, kick-off banquet for community leadership program, second time I have presented for group, most audience members hadn't heard me before, purpose was to be light-hearted and provide leadership inspiration. - The most important element for banquet talks is to provide a simple formula or outline for the audience to follow. Keep it light. Nobody wants to "work" thoughtfully at a meal event. Therefore, I chose my Impact Model as the outline: Influence, Spirit, Class, Legacy. The content also fit one of the purposes - to provide leadership inspiration. - Emotional content just works at evening meal functions; people are more pliable and ready to be entertained and moved. So, I combed through my material and pulled out a few fun stories, humorous bits, engaging yet location-appropriate activities (everyone had pen and paper), etc. - This is a good time to mention where I go to access my resources and material. I primarily use Evernote. It is a free note-taking software for the computer, web and any iOS device. It syncs across all devices, you can create categories, you can search by key word, and much more! I have over 1,300 notes, but when I prep for a program, I really only need to look through two - one that has a wholesale list of all the activities I regularly lead and one that lists out all of my stories/acronyms/lists/etc. I also use Dropbox for repeatable handouts/posters/activity sheets/etc. 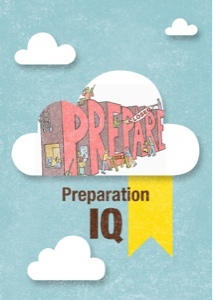 My goal for this blog for 2012 is to provide insight into how I prepare for my programs with a new series titled Preparation IQ. Over the past 20 years, I have delivered thousands of keynotes, workshops and coaching sessions. This experience has provided me a wealth of secrets, strategies and formulas for preparing for presentation success. This year on this blog the secrets will be revealed. 25 adults, 6 hours of presentation time, content is networking strategies, electronic networking and "get to know you" activities. - This is my third year to present at this program, so step one is to review my notes from previous years. I get hired back because they like what I do. No reason to re-invent the wheel. Plus, there is an entirely new group of people each year, so I can use the same material. - This program is very basic in terms of deliverables - help the class get to know each other and teach some networking skills. Therefore, it is very activity-heavy and data-light. I list out all the activities and exercises I plan on doing and create a basic outline. Since I have led all of them multiple times, I have a very good handle on how much time they will take. For this program, I know the audience members don't know each other very well, so I am very careful to keep the sharing at a surface level. - I make sure I have all the material, A/V and handouts necessary for my game plan. - One of the most important prep items is your "30-second sales pitch". This is a statement at the beginning of your presentation designed to inform the audience on why it is important and valuable for them to fully engage. It must be stated from their point of view. For example, my statement for Ada is, "This multi-month experience can either be just something you did once or it can be a life-changing experience. The biggest difference is whether or not you forge friendships with your classmates. Our mission today is to jump-start that process. Join me." There is much more that goes into the prep of each program, but after the series is complete, you will know almost every technique I use. I hope they help kick your Preparation IQ way beyond Thunderdome!